Soak mushrooms in 1/2 cup boiling water for 20 minutes. Drain, reserving 1 tbsp. of the liquid. Discard the stems and thinly sliced the caps. Set aside. 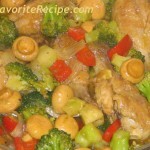 Heat a wok (or a large skillet) over high heat, add 2 tbsp. peanut oil; swirl to coat. Add pork; cook for 3 minutes, or until browned. Remove and set aside. Add the shrimps and cook for 2 minutes, or until just cooked. Remove and set aside. In the same wok, over high heat, add sesame oil and the remaining peanut oil to wok; swirl to coat. Add the ginger and garlic; cook for a minute. 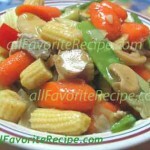 Add green onions, mushrooms, carrots, bamboo shoots and green peas; cook for 2 minutes. Gradually add the rice, stirring until heated through. Return the pork, shrimps and accumulated juices to wok. Add in reserved mushroom liquid and soy sauce; stir to combine. Correct seasonings. Serve immediately.